Financial Times just released its ranking of the Top 1000 fastest growing companies in Europe and Eindhoven made the list! This is somewhat different than a list of “startups” in that it includes a range of early-stage companies from conventional to high tech. Which in our mind is a bit apples-and-oranges, though tech is the largest industry sector on the list, with 149 of the 1000 companies. • SendCloud at a very respectable No. 51. Founded in 2012, SendCloud is a serious company that’s created all-in-one software that makes shipping easier and cheaper for online retailers. It bills itself as the “No. 1 shipping tool for online stores.” With more than 15,000 clients, SendCloud reported 21.1 million euros in revenue and 50 employees. By the way, we think it’s a candidate for Unicorn status in the not-too-distant future. • JAMwerkt, which stands for “Jongen Arbeit Markt,” or young workers’ market, is a digital platform matching companies and part-time workers. Also founded in 2012, JAM is the No. 8 fastest-growing company in the Netherlands and 159th fastest growing company in Europe, according to FT. It reported 2.8 million euros in 2017 revenue, with 108.2 percent annualized compound growth rate. The Netherlands as a whole had made a modest impression on the list, with only 25 companies out of 1,000. Compare that to Germany (230), Italy (223) and Great Britain (135). Not great for a country that prides itself on tech and entrepreneurial legacy. For the record, little Estonia has the No. 3 company on the list, Taxify. The Netherlands-based startup highest on the list is NBWM, an Amsterdam-based international money transfer fintech firm ranked at No. 10, with 263.2 annualized compound growth rate, 6.87 million euros in 2017 revenue and 30 employees. With 63 fast-growing startups on the FT list, London remains far out front. However, that number is down from 73 on last year’s list, mostly because of Brexit, and London is losing ground to Paris. Berlin is also a major startup center mostly because of the support, capital and talent of Rocket Internet and the Samwer Brothers. But the shocker is that Milan is No. 4. It’s also shocking how few Amsterdam-based companies are on the list. How can that be? Maybe because some of the largest companies we think of as “startups” have already become publicly traded companies including Adyen, or were long ago acquired by American companies including Booking.com, acquired back in 2015 by Priceline. • it’s a trust-based list created with submitted financial data from privately held startups. • rather than looking at valuations, FT ranks companies by annualized revenue growth, which – as we’ve seen with Amazon, LinkedIn and other U.S. tech giants – isn’t always a predictor of ultimate market success. We know of several startups here in Eindhoven that have hundred-million-plus valuations, but little or no revenue yet. • it includes companies across the board from marketing startups to food & beverage, and the Netherlands is strongest in the pure sciences. Other Dutch companies on the list include No. 76 Reiskundig (Travel Capable) based in Utrecht and digital on-demand printing firm CustomGroup at No. 104. Our takeaway? With 25 companies on a list of 1,000, this should be a wakeup call for all those bureaucrats in Den Haag who think Dutch startups can live on the fumes of government subsidies. • FasTrackathon: On 27 March, we’ll have the next gathering of talent who’ll build companies around advanced technology, tech so advanced you might not even realize it exists. Think of FasTrackathon as a reverse hackathon … an invitation to get acquainted with deep tech, then build your own venture. HighTechXL supplies the technology and defined application. You supply ideas on building the venture. HighTechXL has worked with CERN and Nikhef since last summer, building three startup teams currently advancing through a 9-month special edition accelerator program. Now, they’re putting together the next cohort, and they need skills from many domains – entrepreneurs, physicists, engineers, market researchers, operations experts and business professionals. FasTrackathon focuses on four advanced technologies, two of which are technologies CERN startup teams are already using to build their ventures. Those two teams are searching for people with whom they can partner to broaden the application areas of their technologies and which they will support. The other advanced technologies from Nikhef and TNO hold promise in some unique application areas, which are ready for new teams to “fast-track” on 27 March. FasTrackathon is scheduled for 13:30 to 17:00 at the Conference Center, High Tech Campus Eindhoven. • Beyond Tech: Beyond Tech on 11 April will be one of the biggest Dutch tech conferences of 2019. As of the end of March, 100 startups have signed up and more than 80 investors and corporate partners. On the agenda are 25 Expert Sessions (workshops) featuring high-profile presenters with topics like innovation, sustainability and entrepreneurship. Hear the story of Dutch startup Psylaris and their time at Y-Combinator in The Valley, or how imec leverages technology to strengthen the socio-economic backbone of a city. And, like, 23 others. You can see the full schedule here. And we’re still two weeks out, so yeah, this is going to be epic!!! We’re expecting a full house, so please register here for this free event at High Tech Campus Eindhoven. We just got back from Stefano Boeri’s Italian Design Day lecture at Technical University of Eindhoven’s conference center, and we can say this – the future of this city is verticle and green. That and Eindhoven is about to become part of a big global experiment that could provide a solution to combating climate change. 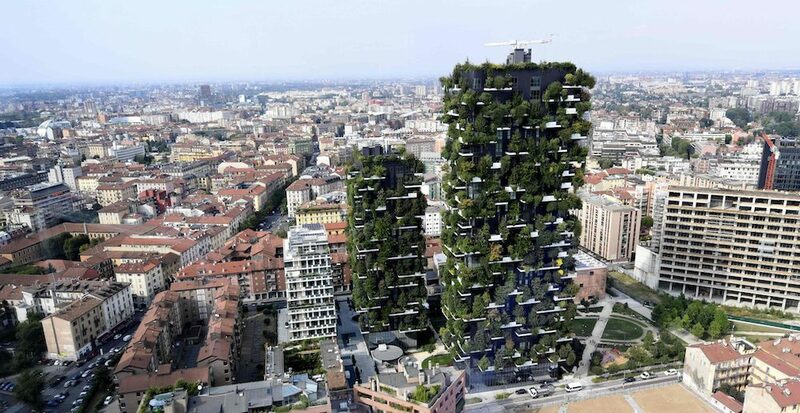 Boeri is one of the world’s most famous architects/urban planners and the creator of the vertical forest concept. His firm turns high-rise residential towers into platforms for trees and other vegetation that are decorative and cooling and cleanse the air of pollutants. Eindhoven is the next city scheduled to get a Boeri Vertical Forest, planned for Strijp-S next year. The Milan native has built two such buildings in his hometown, with others planned for Utrecht (just north of Eindhoven), Paris, Shanghai and even Tirana, Albania. His “The City of the Future” talk centered on how architecture can bridge the gap between humans and nature. “What can we do to make cities the protagonists in the story of climate change or even change the story of climate change?” Boeri said. Then there’s the science of getting tree roots to grow in a circle in their containers. All this data he’s collected for years is public, Boeri noted. “But every time, we start again” in the process of perfecting vertical forests. The first step, Boeri emphasized, is always selecting the trees, plant and shrubs. THEN he designs the building: “We consider trees the real tenants, the real clients.” He added that he’s pleased the Eindhoven project will be the first dedicated solely to social housing. Sint Trudo Housing Association is developing the Trudo Tower here, with its 125 units scheduled to be open next year. But Boeri emphasized that he has much more ambitious plans to build cities full of green buildings and green spaces. A packed house of 200 attendees got no handouts with information about Stefano Boeri Architetti firm, which has projects all over the world. Boeri and the moderator were late, and we ran out of time before we could ask our questions about the practicality of such buildings. Because any time you build something that’s unconventional, count on adding at least 20 percent to the cost. All that said, kudos to Martijn Paulsen, CEO of Dutch Design Week, who kept the show going with his banter including some good information about Eindhoven’s plans to build 10,000 housing units in the city center near the central train station. That was of interest to us because we’re dedicating several EBBs to an overview of the housing coming online in Eindhoven. This is for you American expats jonesing for The Bell. Though Yum! Brands’ KFC chicken chain reigns supreme in the Netherlands, we just got a Taco Bell in Eindhoven in 2017. We suspect our Taco Bell is an experimental store as the brand explores Europe, because it closed last year only to reopen. We posted about it because Eindhoven space is unique, still one of our favorite places to chill. Anywho, our posts caught the eye of the Taco Bell international media person in Irvine, Calif., who sent us a release about their new Chicken Nachos arriving in the Netherlands. You can get a five-piece order for 2.50 euros or spring for 5 euros and get Mexican fries and a medium drink. Or, pony up 8 euros for the Chicken Nachos Quesadilla Box. This apparently is a limited-time offer, kind of like those ribs at McDonald’s. Oh, well. • YUM! Brands’ goal is to expand Taco Bell’s international presence to 1,000 restaurants by 2022. • The Bell and its franchisees operate more than 7,000 restaurants, generating more than $9 billion in sales. Look out, Europe and China! Also, we do want to talk to someone at YUM!, which is based in Louisville, KY, about why the KFCs are slammed here every hour they’re open. We like chicken as well as the next person, but we’d bet a bag of burritos that per-square-foot sales in the Netherlands are three-times KFC sales in the States. The next Drinks, Pitches & Demos pitch and networking event is scheduled for 3 April at Building 27 on High Tech Campus. Which as we always point out is the largest startup hub in the Netherlands. The last DP&D featured an appearance by Steve Butler, counselor for Political and Economic Affairs at the U.S. Embassy in Den Haag. Butler pitched the Global Entrepreneurship Summit 2019 coming to Den Haag 4 and 5 June. So don’t miss this one because who knows what will happen. It’s that kind of event.